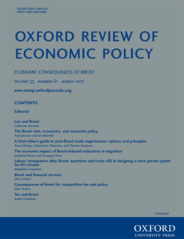 The Oxford Review of Economic Policy is a refereed journal which is published quarterly. Each issue concentrates on a current theme in economic policy, with a balance between macro- and microeconomics, and comprises an assessment and a number of articles. It gives a valuable appraisal of economic policies worldwide. Brexit is a once in a generation opportunity to get rid of one of the most inefficient policies the EEC, and then the EU came up with upon which most of the EU’s money has been spent. Brexit is a once in a generation opportunity to get rid of one of the most inefficient policies the EEC, and then the EU came up with upon which most of the EU’s money has been spent. There is no obvious case to spend £3 billion, given all the other calls on public expenditure. There is however a strong case for using some of the money freed up on more environmental public benefits. This should be developed as a core part of the over arching 25-year environment plan. Indeed it must be if the 25-year plan is to be delivered since around 70% of the land is subject to agricultural use. Featured image credit: Agriculture cereal clouds by Pexels. Public Domain via Pixabay. Professor Dieter Helm is an economist specialising in utilities, infrastructure, regulation and the environment, and concentrating on the energy, water, communications and transport sectors primarily in Britain and Europe. He is a Professor at the University of Oxford, Fellow of New College, Oxford, and a Professorial Research Fellow of the Smith School of Enterprise and the Environment. Dieter is the author of Natural Capital - valuing the planet (2016), director of Aurora Energy Research, a leading energy modelling company, an Honorary Vice President of the Berkshire, Buckinghamshire and Oxfordshire Wildlife Trust, and an Associate Editor of the Oxford Review of Economic Policy. He is the author of the article “Agriculture after Brexit” published in Oxford Review of Economic Policy. This is a good article and I commend it. I respectfully suggest it would be improved if mention was made of the need for WTO ratification of any changes to UK agric policy post-Brexit from the current CAP instruments and financial allocations. It’s not simply a matter of changing farm policy – the WTO (all of its members) has the right to object to post-Brexit changes that fall outside current WTO commitments on farm policy. It’s another example of Brexiteers “not taking back control”. Matter of accuracy: the EEC/EU never subsidized agricultural production directly – it did so indirectly through market intervention (official buying and storing of surpluses which were then exported with large subsidies), plus prohibitive variable levies on imports. The UK, on the other hand, did subsidize production directly through deficiency payments paid to farmers under the 1947 Agriculture Act. This operated from 1947 to 1973, when the UK joined the EEC.